We’re so excited about the free printable Budget Planner 2019 by Shining Mom! It’s one brilliant planner designed to help you successfully manage your finances. There is no better time to start your journey to financial wellness than now. It’s time to save more and invest more and to finally make your money dreams come true! This amazing finance planner with easy-to-use budget templates will help you cut down financial leaks and make simple and educated changes in your spending habits. It will also help you set your ideal monthly and weekly budget that you can stick to. It’s absolutely for FREE! Friends! It’s a big day here at Shining Mom blog because one of our most popular freebies is released today– our yearly budget planner! I am more than excited to present to you this all-new 2019 edition! It has over 30 budget worksheets that are carefully thought of to help you manage your hard-earned income. Do you have the tendency to splurge on wants? Admittedly, without planning ahead, I can easily do, too. To take full control of my finances, I always feel the need to budget my money. Knowing how much I can spend per category (food, entertainment, transportation etc.) helps me control possible financial leaks. As always, my nifty budget binder is my helping hand! If you’ve been following the blog for any amount of time, you surely know by now how much I love budgeting worksheets and how passionate I am in creating worksheets that work. My personal budget binder has been my secret weapon to successfully manage my income. My budget binder gives me a system to wisely manage what I have. Readers say that the past editions of my budget planner have been helping them sort things out,too. 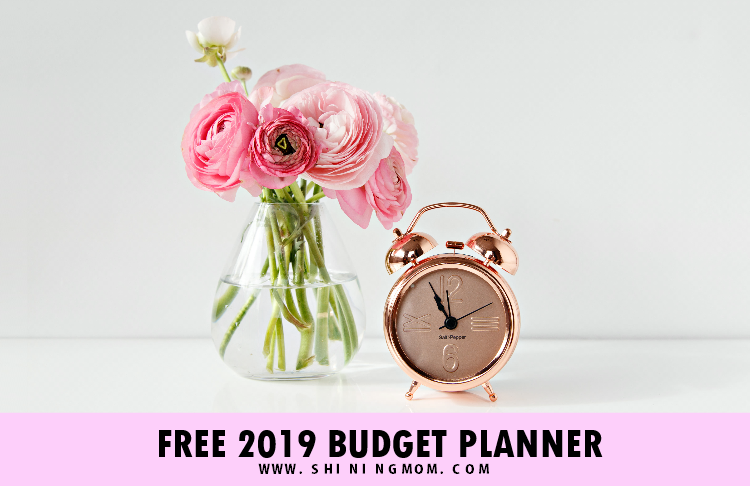 I hope you can make this free printable budget planner 2019 work for your advantage as well! Getting ready to be more financially wise in 2019? This year’s 2019 Budget Planner by Shining Mom is a whole new planner to love! Please enjoy this freebie! The FREE Printable Budget Planner 2019 Everyone Needs! I had a clear goal in mind while creating this new planner I wanted to eliminate the overwhelm in budgeting so I tried my very best to keep each page simple, practical and very easy to use. I hope you’ll find this planner practical and pretty as I intended to! Identify your financial dreams and goals. Create an ideal monthly and weekly budget for yourself and your family. Keep track of your monthly spending. Plan your menu ahead while keeping the budget you’ve set in mind. Keep track of your monthly and annual bills. Save more AND be financially free, finally! I know you’ll find more ways to make this planner work for you. Keep scrolling to explore the functional, practical and simple budget worksheets included. Ready to take a closer peek to some of the pages included? Without further ado, I am happy to present to you this ultimate budgeting planner for 2019! I am huge on setting goals. I always start all the planners that I create with goal-setting pages because I believe in the power of knowing your directions first before starting your journey. For your fee printable budget planner 2019, I included several dream boards and pages that will let you grab your favorite cup of drink and brainstorm how you like your year to look like. What are your financial goals in 2019? Aim freely and start writing your action plans on how they can be achieved! 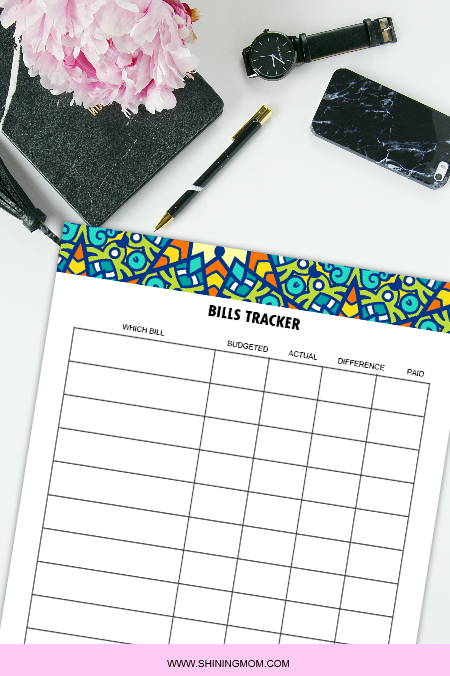 The next printables included are the bills and spending logs. Not only will these worksheets help you track your spending, they will also help you evaluate if your expense is fixed or controllable. Understanding how you spend your money will help you know how much you can potentially add to your savings. Learn to cut back on your controllable expenses you will surely see your savings grow! Set an Ideal Budget and Stick To It! Now that you know how much you spend, you are ready to make a clear budget, be it weekly or monthly. The next pages included will give you a system to easily create a budget plan. That’s about it! Over 30 printable budgeting worksheets that are all ready for printing! A shout out to Quili of Design Cuts for the spectacular patterns I used in designing this planner. If you’re to snag your free printable budget planner 2019, quickly check out these printing reminders and instructions. 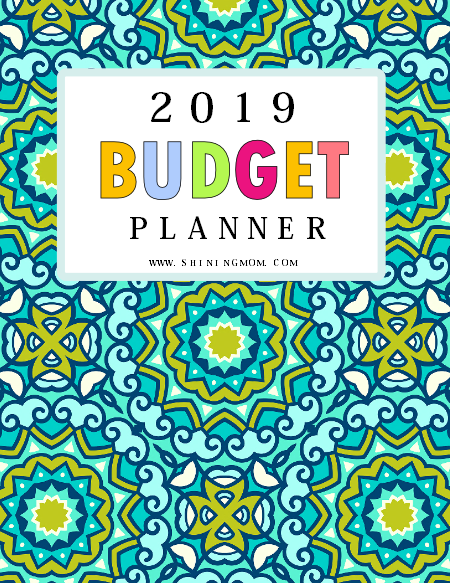 Instantly download the free printable 2019 budget binder HERE or receive the files straight to your inbox by joining the over 30,000 newsletter subscribers HERE. By subscribing to the Shining Mom mailing list, you will receive notices for promotions and freebies released on the blog. Yup, you’ll not miss any Shining Mom planner again! Print the planner in US Standard letter-size paper with 8.5″x11″ dimensions. You may also print it using A4 sheets, just be sure to adjust your printer setting. This budget binder is free for personal use only! Amazing 2019 Planners and Calendars! 2019 Success Designer: The Ultimate Goal-Setting Planner! Oh, may I ask help from you? Can you please help me share the freebie by passing this post forward? Pin this post at Pinterest for others to see! I will be very grateful if you will. Lastly, don’t forget our top free planners for 2019– the Design a Life You Love Planner and the Happy Life Planner! You’ll be happy to have these two amazing freebies in your home or office all through out 2019 to help you stay organized and productive. May you have an amazing 2019. Wishing you financial success! « FREE October 2018 Calendar: 12 Awesome Designs! thank you for your effort in putting together this lovely budget binder. It will come in very handy as this is one of my New Year resolutions…..keep on top of the budget. This is very generous. Thank you! I almost purchased a similar product and yours are much nicer. I appreciate these and will use them to help my finances this year.